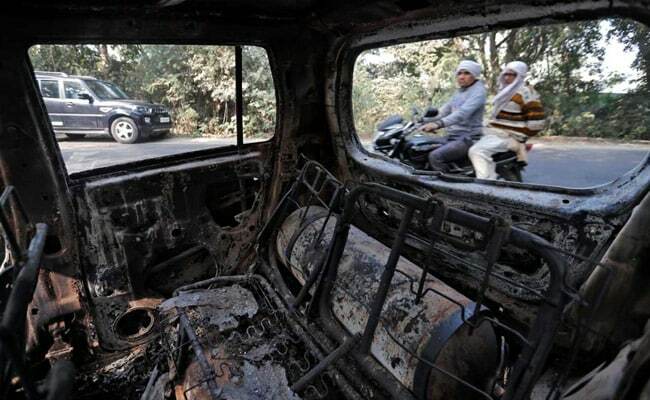 The violence had erupted after a mob of some 400 people rampaged through a village in Uttar Pradesh's Bulandshahr. One of the three prime accused in the case related to Bulandshahr violence -- in which a police officer was shot dead on December 3 -- has surrendered before a local court. Vishal Tyagi, a Vishwa Hindu Parishad member, was missing since the clashes. He has been sent to a 14-day judicial custody. So far, 18 people have been arrested in the case, but the main accused, Yogesh Raj, a local Bajrang Dal leader, is still missing. The violence had erupted after a mob of some 400 people rampaged through a village in Uttar Pradesh's Bulandshahr after 25 cow carcasses were found in a jungle near a police post. During the violence, inspector Subodh Kumar Singh and a 20-year-old man died of gunshot wounds. The police officer and his team had gone to the area to control the violence when they came under attack. Two weeks after the incident, the police are still searching for Yogesh Raj. On December 5, the Bajrang Dal leader had released a video on social media, claiming innocence. He claimed he was at the police station when the clashes broke out. "The police are trying to project me as a repeat offender," he claimed in the video, before going on to relate his version of the story. "Two incidents had occurred that day. When I heard about the first one (the discovery of five carcasses in a forested area) at a nearby village, I reached the spot along with my colleagues. The police were also there. Once peace was established in the area, we went to a nearby police station to lodge a complaint. I was still there when I heard that clashes had erupted, leading to the death of a youngster and a police officer," he said. The police had arrested a soldier from Jammu in connection with the murder, but later said they had no conclusive evidence against him. They however said there was proof that Jitendra Malik was at the scene of the crime. Uttar Pradesh's top officer had told NDTV that videos from the spot indicated that the army man was "instigating the crowd". Jitendra Malik has claimed he was not involved in the murder of the police officer or the mob violence. Following the police officer's murder, opposition parties had launched a scathing attack on the Yogi Adityanath government. The Samajwadi Party and Mayawati's Bahujan Samajwadi Party alleged "complete lawlessness" in the state. Yogi Adityanath, who had first spoken of a "big conspiracy" in the police officer's murder, later called it an accident. " No mob lynching happened in Uttar Pradesh, what happened in Bulandshahr is an accident," he had said at a function. Several police officers, including city's police chief, were shunted out in the wake of the violence.